First, let's talk about how search engines work. When a user types in a set of search terms (keywords) into their selected Search Engine, the search engines puts those keywords into an algorithm to decide which pages to show and in what order to show them. The Search Engine Algorithm measures how each page ranks for the entered keywords returning the page with the best rank in the top spot. It all starts with a good list of keywords. What is a keyword? It's a word or phrase your client would use when searching for your specific services on the web. • What it is it you do, where do you do it and who do you do it for? Let's brainstorm a list of good keywords for your business. Now you are ready start brainstorming keywords. Aim for a list of 10 – 20 good keyword phrases. Go! Where to use your keywords on your website (or even your newsletter!). Before you get started, we need to consider a few more rules. What you write must make sense to the reader. Yes, you want to get found in search, but you also want the human who searched for you to stick around once they get there and not think you are a weird robot. Each page needs its own unique Page Description or Google will think they are identical and therefore one of the pages isn’t important because it’s a copy. The same goes for images. Describe the image well, use keywords if they fit. Even if you don’t use “your keywords” if someone was looking for that picture, they’ll stumble across you and might stick around (or at least remember you later). Don't look back just yet. Start using your new keywords with every new blog post, every new web page, and every new image your add to your portfolio. These are the pages you would like to see come up in Search Results, for example your Home, Services and Portfolio pages. Limit yourself to 2-3 pages to start, but don’t limit yourself to the items noted in the "Where to Use Keywords" section above. Think about the terms you are using in your package names and descriptions and start making sure you've named them in a way that reflects their value to your consumer - addressing what they need and want. Use Google Analytics in conjunction with your good judgement to decide what your most popular pages and blog posts are. Now don’t go back to your blog posts from 2015 and start fixing the image names on every single post. UNLESS your most popular blog post is from 2015 and then just fix THAT post and move on. Remember your "Moving Forward" strategy as you continue to add new content to your website. Speaking of moving forward, let's do the next thing that will make the Search Engines really value your website. Clean up any broken links on your website. Search engines don’t like a broken web, so make sure you fix any broken or dead links. Use a free service like W3C's Link Checker to track down broken links. You can also use Google Webmaster tools, but either way, once you've got your list, it's time to start cleaning things up. If it’s a link to another website, find similar content and relink OR rewrite your content and remove the link. If it’s a page on your website that no longer exists, create a 301 redirect that sends the visitor to another similar page instead of sending them to your “Page Not Found” page (aka 404 error page). You'll also want to make sure your “Page Not Found” page (aka 404 page) offers links to other pages your site visitor may be interested in visiting so you don’t lose them! Once you’ve gotten your site spiffed up with a fabulous keyword implementation and freshly fixed links, you’ll want the search engines to take a fresh look at your site so they’ll re-rank you and start sharing your site with the people searching for you(r keywords). For my friends on Squarespace, here's a step by step tutorial on how to get setup for Google and Bing search services, as well as how to get your site re-indexed if you've already completed the setup. For my friends on other platforms, follow your site host's recommendations and use the links below to setup/check on your site in Google and Bing's search services. SEO is not a set it and forget it thing. I know that sounds like a bummer, but what that means is every day you have an opportunity to take over that guy who is ranking in the space above you. If he's not on his game, he's out - leaving you and your long term strategy to keep moving up in Page Rank for your favorite keywords. Here are two long-term strategies you can use keep your page moving up in the “rankings”. Moz says “Satisfied searchers who demonstrate their positive experience through engagement with your site or with links to it.” What they mean is if someone comes across your site, they are only going to stay there if there is something awesome to do/read/see. AND by creating fresh content, they will keep coming back to see what you are up to and to share it with their friends, family and colleagues. Hello SEO Gold! Learn more about how good website design and content affect search engine rankings in Chapter 6 of Moz's Beginner's Guide to SEO. Not sure your website is strategically designed or user friendly? Let's Talk! Links both to and from your website contribute greatly to your page rank. Read more about why this works and how you can get started on a white hat link building strategy to pump up your SEO in Chapter 7 of Moz's Beginner's Guide to SEO. Sidenote: Wondering what is this Moz thing? Moz is a company that provides tools for analyzing and improving SEO. They know SEO and are who I turn to with my SEO questions. This post is not sponsored by them and their Beginner's Guide (as well as some of their awesome tools) are free! Ok! We made it! 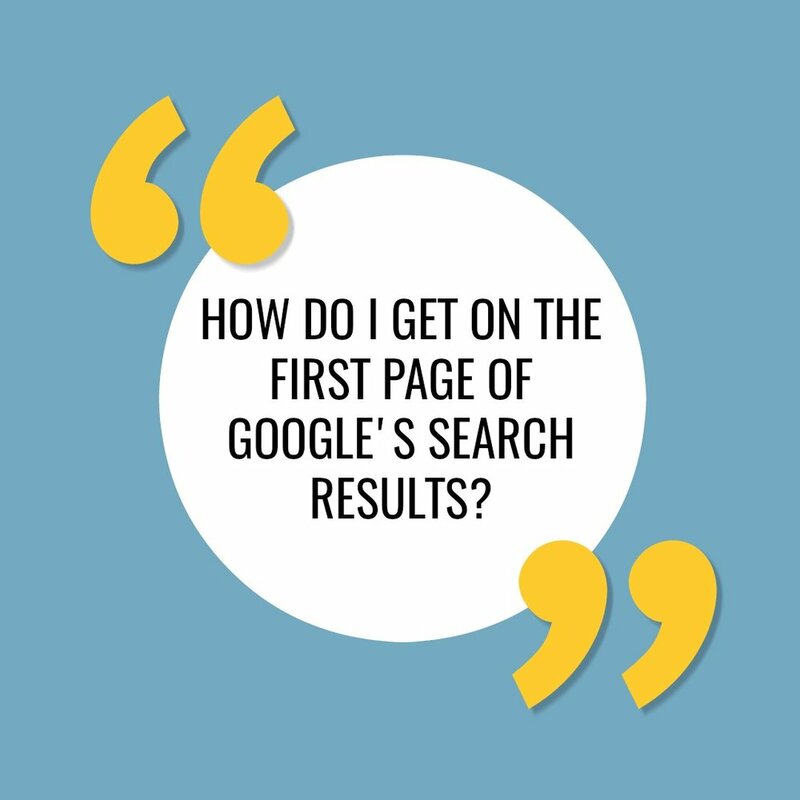 Best of luck in getting onto the first page of Google Search for your favorite keywords! Please let me know if you have any questions (or if I've gotten something wrong). How Do I Start Blogging for My Business?